Tiger Woods’ extramarital affairs made headlines last year, but in spite of his off-the-golf-course troubles, EA Sports forged ahead with the 2010 release of their annual golf franchise. However, Tiger shares the cover spotlight this year with the young North Irish phenom Rory McIlroy, a telling decision. As a golfer, Woods simply hasn’t been his usual self since he returned from his hiatus. 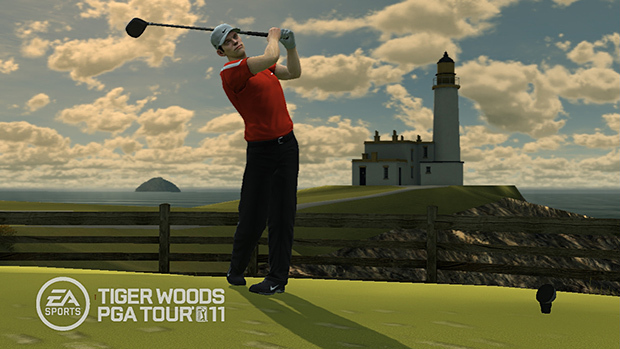 Is Tiger Woods PGA Tour 11 any worse for the wear because it didn’t take a year off in the wake of the scandal? Hit the jump to find out. The entries in EA’s Tiger Woods PGA Tour series tend to offer marginal improvements over their immediate predecessors. That’s not to say that any of the games are mediocre -- quite the opposite, in fact, since few long-running videogame franchises can boast the steady level of quality that PGA Tour has achieved. While you’d be hard-pressed to point to any particular version as the definitive best-of-the-best title, a strongly iterative design philosophy underlies the dependable success of the franchise. 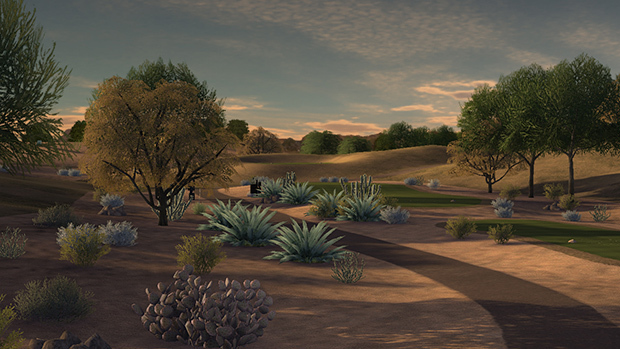 PGA Tour 11 is impressive for its focus on both improving gameplay (primarily by upping the challenge for series veterans) and bringing new ways to play. EA says that they put McIlroy on the box this year to highlight the first-time inclusion of the Ryder Cup in the franchise, although cynics might believe otherwise. A biennial tournament between the US and Europe, the Ryder Cup is a series of golf matches: foursomes (2-on-2; team members alternate shots on the same ball), fourball (2-on-2; each golfer has their own ball), and singles. The game offers an accurate representation of the competition -- two twelve-person teams go at it -- and you can customize the setup as you please. Playing through a Ryder Cup with my created (American) golfer, I definitely felt some patriotic sentiment stirring within me and pushing me to win. The mode works well because you don’t have to rely on your CPU teammates. A scorecard between holes lets you know how your side’s other two-person teams are doing; if you notice that a group is struggling, you can take control of them yourself and lend a hand. The only thing I didn’t like about the Cup’s implementation is that once you begin a match, you’re in for the long haul. There’s no way to save your progress during a round; you have to play all 18 holes in one sitting and can only back out to the main menu after completing one of the five rounds. It can take quite a long time to make your way through a full course, especially when four players are involved, so this is a maddening oversight. A major all-around improvement is the unified experience-point system for your created golfer. Practically everything you do both offline and online earns you XP, which you can use to adjust your attributes, tune your clubs, or buy clothing (much of which boosts your skills). If you’re pressed for time (or just lazy), you can purchase XP on the Xbox Live Marketplace or PlayStation Store, but thanks to the Skills Challenge, you shouldn’t need to resort to that. You can take part in any of 48 Skills Challenges, which task you with matching or besting real golfers in events that test your Power, Accuracy, Control, or Putting. Once you start completing the upper-level challenges, you’ll be rolling in XP. The plentiful experience points may allow you to advance your attributes quickly, but EA Tiburon has scaled up the gameplay challenge accordingly. No longer can you play the game by magicking your ball around the course -- boosting a shot’s power and accuracy, adding spin in midair, or previewing the exact line of a putt -- with impunity. In PGA Tour 11, each of these videogame-y assists has a cost associated with it: Focus. The Focus meter is depleted in chunks as you use the aids, and it refills partially each time you hit a shot without help. This brings in a game-changing strategic element: do you utilize the accuracy boost to hit a narrow fairway, or save your Focus for a preview of a sure-to-be-difficult putt on an undulating green? Longtime PGA Tour players who find the core shot-making mechanic too easy finally have an option available to provide a tougher challenge: the new True-Aim mode. Here, you won’t have an aiming circle that shows your shot’s approximate landing area; instead, all you’ll get are distance markers along the course. From there, you have to take into account your ball’s lie, the wind, draw/fade, and elevation, in order to select the proper club for your shot. In addition, you’ll see variable wind this year (i.e., the wind won’t be a constant 5 mph; instead, it might range from 4–8 mph with gusts up to 11 mph), and even if you hit your ball perfectly, it’s no longer guaranteed to land dead center in the aiming circle. With the usual videogame concessions taken away, you feel much more like a real golfer. 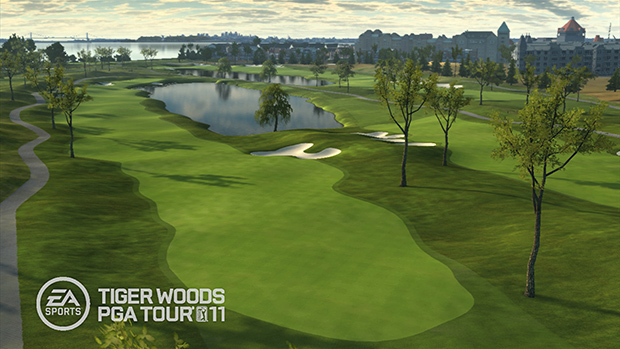 PGA Tour 11 is the first game under the EA Sports Online Pass program. The painless activation process involved redeeming the code on the back of the game manual in the PlayStation Store for a 101-KB download key, and within a minute, I was ready to go. 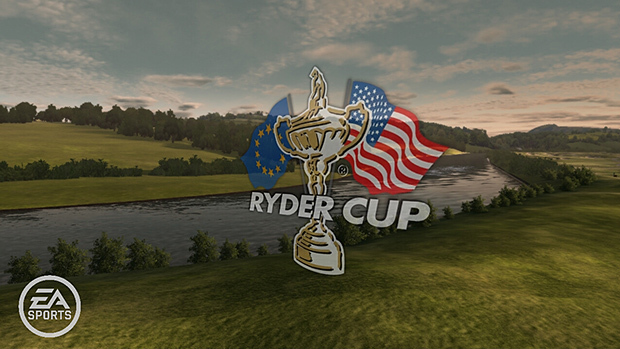 This year, the Ryder Cup has expanded online play; you can play a Cup with a full contingent of 24 human players. Live play-with-the-pros tournaments are back, and there are more EA GamerNet challenges than ever. I played through many matches in the US East lobby and had a completely lag-free experience. Unfortunately, the game still doesn’t allow for custom soundtracks on the PS3, which meant that I was forced to listen to the EA TRAX (at least the PGA Tour series uses instrumental versions of songs). In addition, the commentary pairing of The Golf Channel’s Kelly Tilghman and ESPN’s Scott Van Pelt remains dull and repetitive; I understand that golf is a sport where the commentators don’t blather on endlessly, but I’d still like to hear a more lively and talkative duo. And in the wake of games such as LittleBigPlanet and ModNation Racers, which are driven by user-generated content, I’d love to see the PGA Tour franchise introduce at least a rudimentary course creator. Like Tiger before the scandal, the PGA Tour series is a paradigm of consistency. Year in and year out, EA Tiburon delivers reliably solid, if unremarkable, golf games. 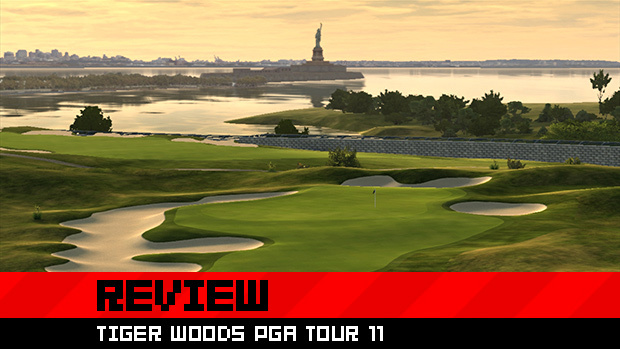 This year is no different: there isn’t anything about Tiger Woods PGA Tour 11 that will blow you away, but a host of notable improvements and additions make this a worthwhile upgrade for die-hard fans of the series and a great choice for golf lovers everywhere. Woods himself may be struggling to regain his form, but Tiburon hasn’t lost its stroke.